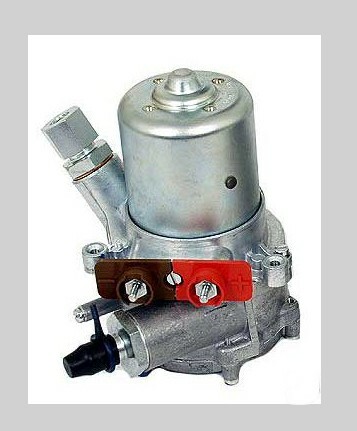 The discussion described here applies to how the author has restored to function several short-body, electric Fuel Pumps used on Mercedes Benz Mechanical Fuel Injected models of the 1960s and 1970s such as the 230//250/280/300 SL/SE. The pumps used on these models have a few different model numbers, but for all intents and purposes, they are basically the same in their construction and manner of operation. The pumps are all electrically driven, 12 volt DC (direct current), low pressure pumps of the rotary vane type. They are of the WET Motor variety in that the motor portion of the pump is not sealed from the vane portion of the pump and fuel flows through the armature/brush areas. This fuel flow cools, lubricates and cleans the brushes and commutator. Unlike the larger body pump, there is no metal bellows type sliding ring (mechanical) seal or a “leak off” pipe. The armature rides in bushing type bearings rather than ball bearings. Power is provided to the 12 segment brass commutator via 2 metallic graphite brushes—these brushes differ in size and configuration from those used on the large style pump. The outlet side of the pump is provided with a mechanical check valve to prevent back flow of fuel into the pump and to maintain pressure in the fuel delivery lines when the pump is not operating. Like the large style pumps, these pumps also include a fine filter element on the inlet side to ensure a flow of clean fuel into the vane portion of the pump. Many of these pumps have been in continuous service for well over 30 years and this is a true testament to their fine German engineering and robust design. While mechanical wear will eventually take its toll on these pumps, perhaps larger sources of pump failures are the use of dirty fuel or prolonged periods of sitting idle while filled with fuel. Dirty fuel has the effect of interfering with the rotary action of the vane i.e. causing a jammed vane which will usually result in a burned out fuse. If efforts continue to operate the pump by bypassing the fuse, the motor will eventually “burn out” through destruction of the armature. Unlike the large pump, there are no field windings, though, to burn out. Prolonged periods of idleness can have a similar effect on the vane if the fuel is allowed to congeal over time in the pump body. Once the pump has been removed from the car and emptied of all fuel, perform a good visual inspection to determine whether it is a viable candidate for further work. If the motor or aluminum pump housing has any severe damage such as extensive corrosion, broken bottom plates, broken off electrical terminals, etc, it is usually used as a parts donor only. Such donors are good sources of various re-usable parts such as rotary vanes, armatures, shims, springs, inlet/outlet fittings, etc. Regardless of the condition of the pump, the o-rings and often times the brushes are replaced upon re-assembly. Many a good pump is ruined beyond repair by injudicious disassembly, so great care is taken while dismantling the pump. The pump body itself is of an aluminum alloy and all fasteners are made of steel. Because the pump is located on the underside of the car, it is subject throughout its operating life to wet road spray including salt spray in areas where salt is applied to the roadways during periods of snowing or icing. This situation makes the pump a ripe candidate for corrosion including “rust-welding” of the fasteners to the aluminum pump body. Attempts to remove such fasteners usually result in torquing off one or more of the fastener heads. The three M4 cheese head screws securing the top section of the pump to the aluminum base section are removed first. This will allow separation of the motor section from the pump chamber section. A large nitrile o-ring seals the motor section exterior from the pump body, however, unlike the large style pump, there is no seal between the pump body and the interior of the motor section. By design fuel is allowed to freely enter and exit the motor section of the pump. There are 2-M4 nuts w/washers that secure the brush electrical assembly to the motor “can”. These are removed next and the “can” is separated from its brush assembly. Note: (Record the orientation of the “can” in relationship to the electrical section carefully since it must be re-assembled exactly this way- otherwise the pump will operate in reverse). This will expose the brushes and springs as well as the complete armature assembly. Spray electrical cleaner to thoroughly clean out the inside portion of the “can” as well as the armature and brush electrical assembly. Remove the inlet and outlet fittings using a suitably sized socket. Dispose of the copper sealing rings under the fittings since they will be replaced with new seal rings. The bottom cover plate is removed next. There are six M4 cheese head screws that secure this to the pump body. This is usually the first place where difficulty is encountered in the disassembly since as indicated above, the screws often times become “weld rusted” to the body and the heads torque off when an attempt is made to remove them. If one or two screws torque off, it usually presents no great problem since the plate can often times be carefully levered off using a disposable blade from a utility knife. This will expose the studs which can then be removed by judicious application of heat from a small oxy-propane torch and use of a set of vise grips. This is extremely dangerous work and suitable eye protection is worn while using the blades. Note: It is essential that the pump be purged of all gasoline and fumes before any open flame source is brought near the pump. The bottom plate can still be removed using this method even if all of the heads are torqued off—it just takes a little more time, ingenuity and work. Often times you can use a small hammer to force wedge a blade between the plate and the pump body and it sometimes takes “stacking” two blades side by side to provide sufficient levering action. This is done after the first blade provides a crevice which can be further widened by the second blade. Again, great care is required to ensure that no damage is caused to the pump body or parts being removed. If the studs cannot be removed intact with the use of the heat and vise-grips, they will have to be drilled out and M4 helicoil inserts installed. This is fairly intricate work because the pump body is aluminum and the studs have a tendency to become hardened as they are drilled—it is very easy for the drill to slip off the stud during this process and to chew into the soft aluminum alloy causing further damage. Once the bottom plate is removed, the rotary vane is removed by pulling up carefully on it with a pair of needle-nosed pliers. Separate the armature assembly from the brush electrical section by removing the small e-clip that is attached to the bottom portion of the armature shaft. The armature is pulled straight up and out of the pump body. Record the number and order of fiber and metal shims on either side of the bushing bearing. Note: there are also shims on the top portion of the armature that fits into the small recess in the top portion of the “can”. Retracting the brushes slightly with a flat bladed instrument greatly facilitates removing the armature. When fully disassembled, the armature assembly parts will consist of the armature/commutator section, several small ring shims, and an e-clip. Note: All parts generally can be used on re-assembly. If the commutator is too far worn or the armature windings are burned out, the armature can either be sent out for a re-wind and commutator replacement or a suitable replacement is used from a donor pump. If the brushes need to be replaced, they can be removed along with their springs with the help of a de-soldering iron. The springs are re-used unless damaged. Replacements if required can usually be salvaged from a donor pump. This essentially completes the disassembly process and at this point, all parts are given a thorough cleaning. With the exception of the armature, the parts are dipped in carburetor cleaner to remove all fuel residue, grease, carbon dust, etc. If required, the metal parts are then carefully bead blasted to remove all rust and oxidation. The motor “can” portion can now be painted or even powder coated since there are no field windings in the “can” that would be adversely affected by the powder coat “baking” process. The re-assembly process is essentially the reverse of the disassembly in terms of the sequencing. The armature, brush springs, ring shims, inlet/outlet fitting, rotary vane, motor “can”, in-line filter and main pump body are normally all re-used. The motor “can” section is assembled first. The brushes are assessed to determine if they are sufficiently worn to warrant replacement. If they need to be replaced, the old ones are removed with a de-soldering iron and new ones soldered in place. The old brushes are replaced with a set of brushes that have a small recess cut on the brush near the shunt attachment point so as to allow easy passage of the brush through the brush holder. If the commutator has sufficient “meat” left on it and the armature is otherwise okay (if not—it is sent for rewind and new commutator or a good donor is used), the commutator is polished with a very fine grade sandpaper (1500-2000grit) by chucking top side up in a drill press and running at a slow speed. 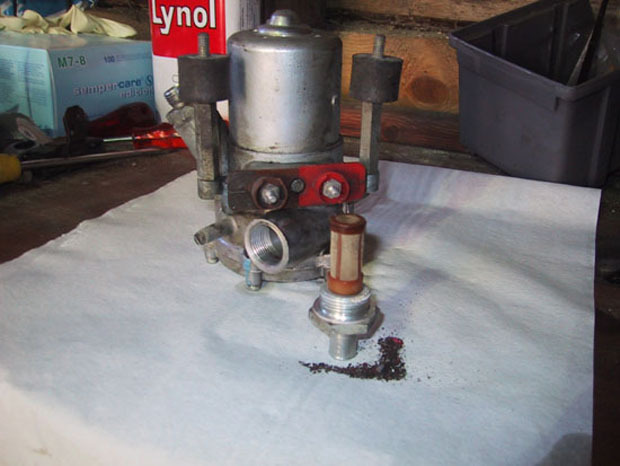 The armature is inserted through the small hole in the pump base being careful to ensure the correct number of shims are used on the motor side as well as the vane side. The brushes are retracted in the same manner as when disassembling. The e-clip is re-attached to secure the armature. Shims are replaced on the top of the armature in the order and number as removed. A rubber o-ring is placed around the top part of the pump base to form a seal between the motor “can’ and the top of the pump base. The “can” is fitted over the brush assembly being careful to maintain the same orientation as before disassembly. The two studs are passed through the holes in the brush section and 2-M4 nuts and washers are used to secure it in place. Care is taken to ensure that the o-ring seats properly. At this point, the motor assembly is connected to a 12 volt D.C. source and run for a short time to ensure there is no binding or other fault and that the armature is rotating in the correct direction. If it is not, then the “can” will need to be removed and rotated 180 degrees. The entire motor section is next attached to the main pump body by first placing a small rubber o-ring over the “nose” of the section where the armature shaft is. This will cushion the motor section against the pump body. Next, a large rubber o- ring is stretched around the circumference of the motor section. The motor section is then lowered over the pump body and secured with 3-M4x12 Cheese head screws and washers. The pump assembly is turned over and vane installed. The vane must be installed with the narrow portion of the vane teeth pointed up towards the motor portion of the pump assembly; otherwise the pump will not push the fuel out of the pump properly. A large o-ring is inserted into the bottom pump base groove, the bottom plate cover put over the top and the six M4 Cheese head screws and washers used to secure it in place. A little SEAL ALL or other fuel compatible sealer—not silicone based- will help the o-ring sealing (Note: The bottom plate cover can be honed on a piece of plate glass with some fine grinding past if it is grooved—if the grooves are excessive, it is best to use a better one from a donor pump. This basically completes the process. The pump is now tested with fuel (Diesel, kerosene or even alcohol since these are less volatile and dangerous to use at this point than gasoline) in a small fixture to ensure proper pumping action including delivery volume and current draw.